Foothills, montane. Disturbed areas, meadows. Summer. Canyons of the Ancients National Monument, June 12, 2005. Linaria dalmatica typically grows in a mass of stems, three or four feet tall. Flowers are numerous along stout vertical stems above thick, clasping, ovate leaves. Numerous young shoots with small, crowded, overlapping leaves are common at ground level. Linaria dalmatica is a recent, and unfortunately successful, invader of the dry areas of the Four Corners. It is a close relative of Linaria vulgaris, below. 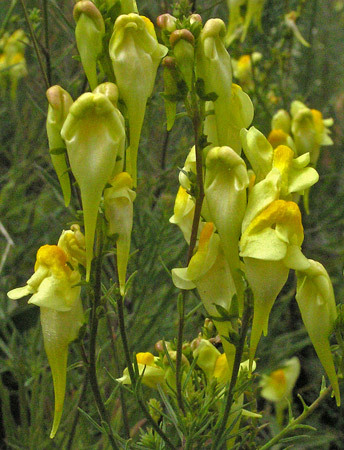 The two species of Linaria hybridize. 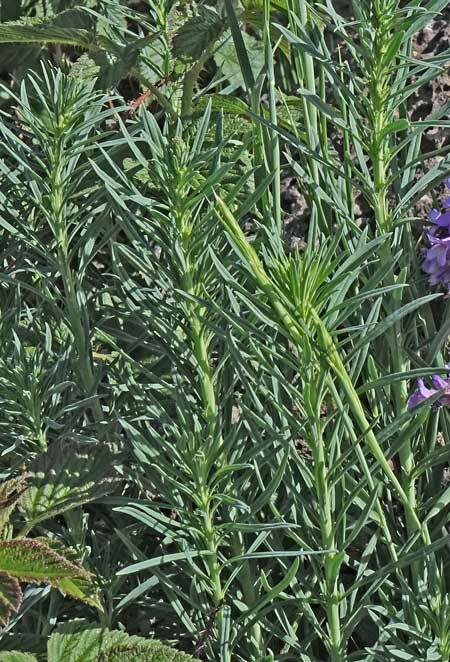 "Linaria" is for the resemblance of the leaves to those of Linum (flax) and "genistifolia" is apparently from the Latin for "a kind of broom plant". "Vulgaris" means "common". 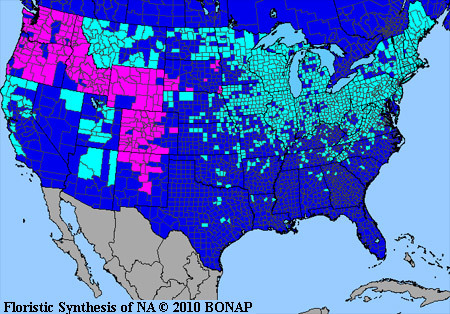 "Dalmatica" refers to the Dalmatia region of southeast Europe. The Linaria genus was named by Philip Miller in the mid-1700s. 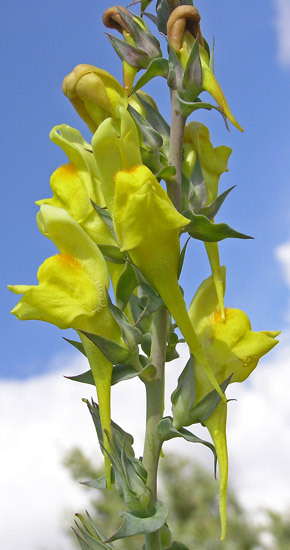 This species was first named Antirrhinum dalmaticum by Linnaeus in 1753, was renamed Linaria dalmatica by Miller in 1768, and in 1908 was named Linaria genistifolia subspecies dalmatica by Maire et al. 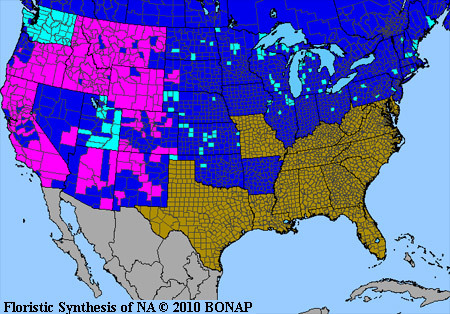 Yellow and gold; butter and eggs. Occasionally, growing tips are afflicted with abnormal cells which explode the terminal flower. 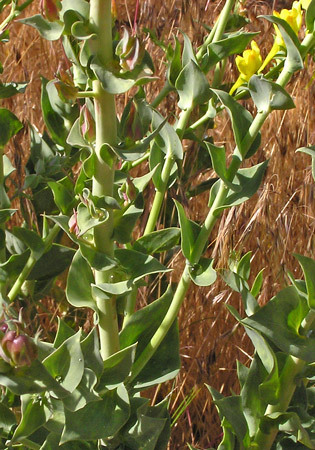 Emerging seed pods foretell the continued spread of this noxious, invasive species. Foothills, montane, subalpine. Disturbed areas, meadows. Summer. 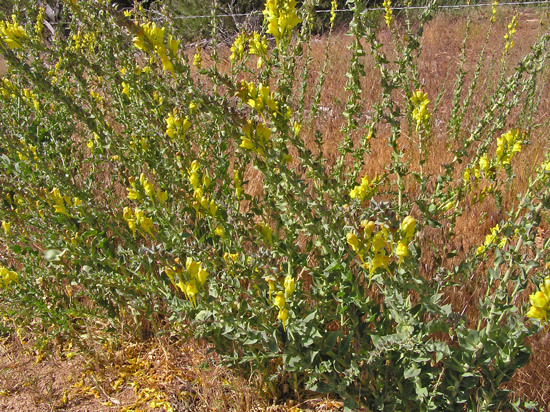 This is unfortunately a well-established noxious weed and a common sight in vacant lots, along roadsides, and occasionally in mountain meadows. 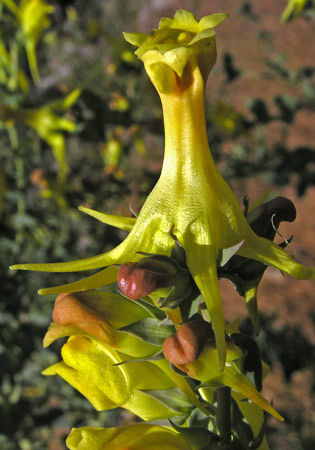 It is a remnant of the mining towns whose residents often planted this hardy plant to brighten their yards with its abundant, long-lasting flowers. Linaria vulgaris hybridizes with Linaria dalmatica (see above). Grand Mesa, July 11, 2017. 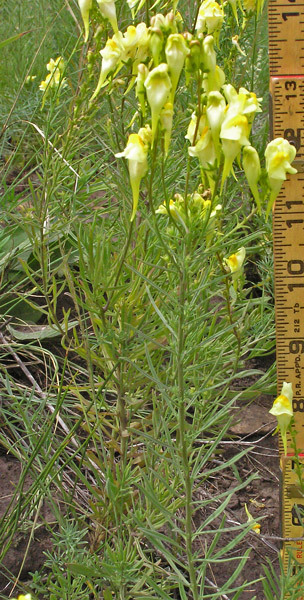 Linaria vulgaris grows less than a meter tall and has narrow leaves to two inches long. The Linaria genus was named by Philip Miller in the mid-1700s. From collections made in Europe, this species was at first named Antirrhinum by Linnaeus in 1753 and was renamed by John Hill in 1756. Linaria vulgaris' common name comes from its flowers which have orange (eggs) accompanying the yellow (butter). Linaria vulgaris flowers are lovely shades of yellow and orange in a strangely upright posture as if the flower were some kind of creature standing on its hind legs sniffing the breezes.